All the correspondence of Da Saheb is under the possession of ‘Jawahar Lal Nehru Memorial Museam’ and ‘National archives’. Some of it is with ‘Rajasthan Archives’ Bikaner. We could procure photo copies of some of the correspondence preserved with ‘Jawahar Lal Nehru Memorial Museam’, New Delhi. Out of the procured correspondence only a few letters from Gandhi ji, Nehru ji and other national leaders are being put up on this web site. 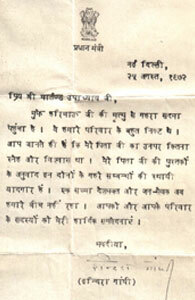 Viewers would mark that this correspondence is essentially of pre – independence era. We did not go for post independent correspondence on purpose. Any viewer interested in correspondence can contact the above organizations. We would like to thank the officials of the Nehru Memorial museam for helping us in getting the photocopies.